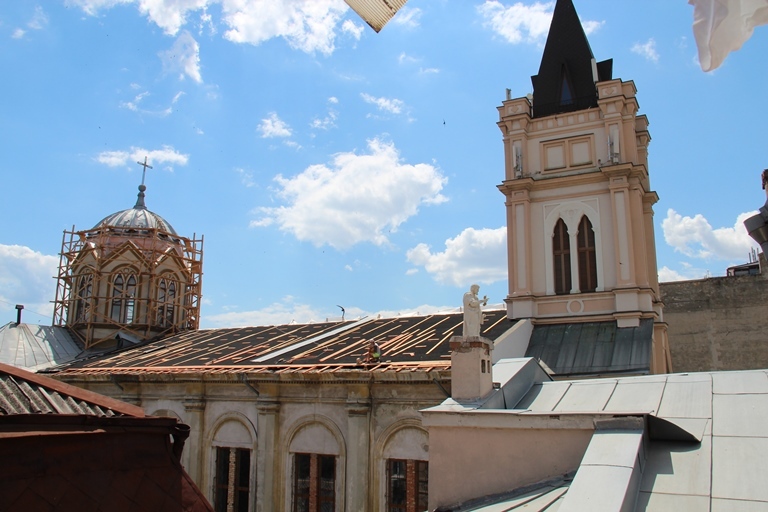 A large problem for particularly the Greek-Catholic Church in Ukraine is that many of the buildings that were once church property were taken over by communist authorities and the properties have yet to be restored to their proper owner. In one case, a church had been turned into a bus station! Odessa’s cathedral served as a gymnasium in Soviet times! The cathedral of Odessa was returned to the Church in 1991, but not the surrounding buildings that were once owned by the Church as well. These are now in the hands of private parties who, assuming the Church is rich, are seeking a high price for the properties. The situation makes for very cramped and difficult living conditions for priests and prelates alike. Auxiliary Bishop Jacek Pyl, who usually works in Crimea but is no longer able to return there, is living in the room of a priest currently studying in Rome. Up until recently, Bishop Bernacki himself was living in a steeple! The Roman Catholic parish church of St. Joseph in Dnepropetrovsk deserves special mention. The communists confiscated the church in 1949. First turned into a so-called “Monument of Communism,” the building has changed hands numerous times. In 2007, a group of Catholics praying in front of the church were assaulted by security guards, who even beat up on elderly women among the group. It was only in 2009, following a long and difficult legal battle, that ownership of the former church was returned to the Catholic Church. Its re-consecration was occasion for a splendid celebration. Aid to the Church in Need has helped build or renovate numerous churches and catechetical centers throughout the country. Last year alone, the organization contributed $5.2M in aid to Ukrainian Church communities.